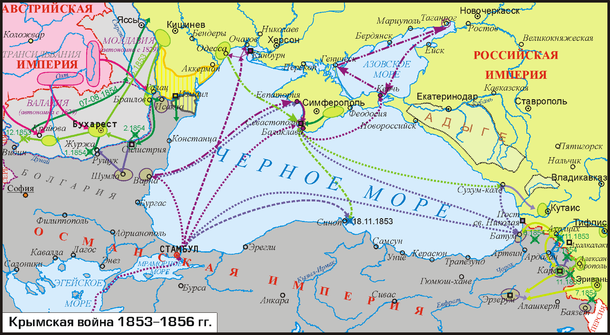 The Crimean campaign opened in September 1854. Three hundred and sixty ships sailed in seven columns, each steamer towing two sailing ships. 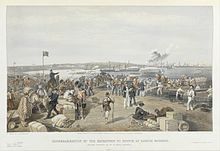 :422 Anchoring on 13 September in the bay of Eupatoria, the town surrendered and 500 marines landed to occupy it. This town and bay would provide a fall back position in case of disaster. 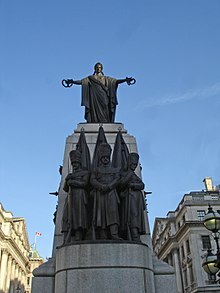 :201 The ships then sailed east to make the landing of the allied expeditionary force on the sandy beaches of Calamita Bay on the south west coast of the Crimean Peninsula. 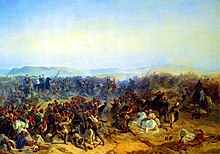 The landing surprised the Russians, as they had expected a landing at Katcha; the last-minute change proving that Russia had known the original campaign plan. 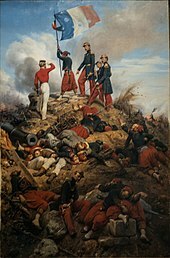 There was no sign of the enemy and the invading troops all landed on 14 September 1854. 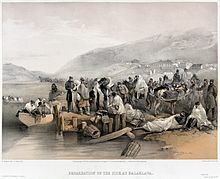 It took another four days to land all the stores, equipment, horses and artillery. 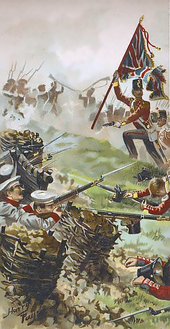 The landing took place north of Sevastopol, so the Russians had arrayed their army in expectation of a direct attack. 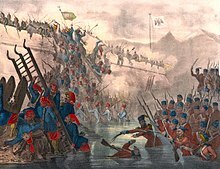 The allies advanced and on the morning of 20 September came up to the River Alma and engaged the Russian army. 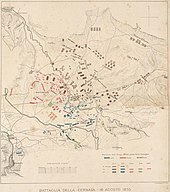 The position was strong, but after three hours,:424 the allied frontal attack had driven the Russians out of their dug-in positions with losses of 6,000 men. 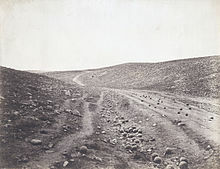 The Battle of the Alma resulted in 3,300 Allied losses. 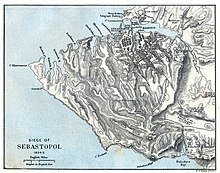 Failing to pursue the retreating forces was one of many strategic errors made during the war, and the Russians themselves noted that had the Allies pressed south that day they would have easily captured Sevastopol. 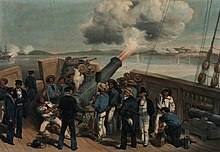 Believing the northern approaches to the city too well defended, especially due to the presence of a large star fort and because Sevastopol was on the south side of the inlet from the sea that made the harbour, Sir John Burgoyne, the engineer advisor, recommended that the allies attack Sevastopol from the south. 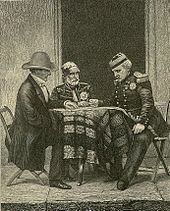 The joint commanders, Raglan and St Arnaud, agreed. 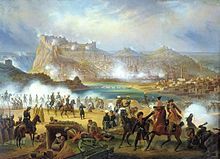 :426 On 25 September the whole army began to march southeast and encircled the city from the south, after establishing port facilities at Balaclava for the British and at Kamiesch (Russian: Камышовая бухта, translit. Kamyshovaya bukhta) for the French. The Russians retreated into the city. Reinforcements for the Russians gave them the courage to send out probing attacks. The Allied lines, beginning to suffer from cholera as early as September, were stretched. 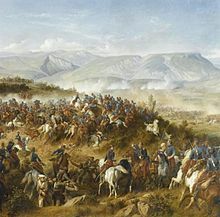 The French, on the west had less to do than the British on the east with their siege lines and the large nine-mile open wing back to their supply base on the south coast. 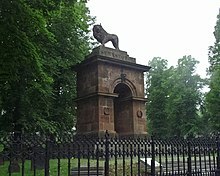 This page was last edited on 24 April 2019, at 06:01 (UTC).